Feeding chameleons has become old hat to most keepers. The variety of commercially available feeder insects is staggering when one compares to days of mealworms and crickets only. But even with this smorgasbord of bugs available to us there are still many untapped feeders out there that can be added to your chameleon's diet. These alternative feeders provide not only a different nutrient content but a new stimulus to your captive chameleon. The following provides only a small sampling of uncommonly used insects that can be utilized as feeders. Roaches - Although many keepers are using tropical roaches for feeders many are still haunted by the "roach" stigma. Tropical roaches, as outlined in the May 2003 issue, make excellent feeder insects for captive chameleons. There are a handful of popular species used by many keepers today, but a few less commonly kept species can be a readily accepted addition to your chameleon's menu. One species in particular that is uncommonly used is the Green Cuban Roach (Panchlora nivea). This small roach is an excellent choice for getting a fasting chameleons attention. Bright green in coloration and capable of a fluttering flight, these roaches attract the attention of most chameleons they are presented to. Keeping, feeding and breeding the Green Cuban roach does require a bit of preparation but overall they are quite easy to deal with. Being a glass climbing species as well as a flyer the Green Cuban Roach must be kept in a cage with a tight fitting lid. A barrier such as vasoline or a Teflon based product such as Bug Block, Bug Barrier, etc can also help prevent unwanted escapees. P. nivea reproduce best under higher humidity conditions than other commonly kept species of feeder roach. Successful colonies are often setup with a substrate of moist coco fiber or topsoil several inches thick with plenty of climbing and hiding areas such as stacked egg crate. 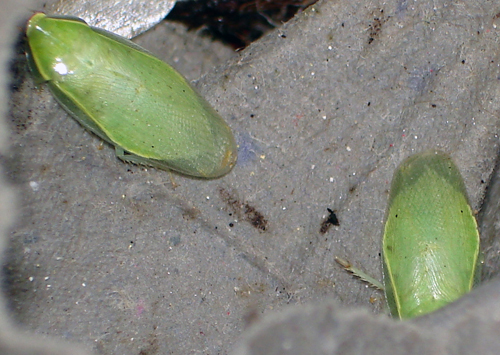 The dark colored nymphs spend most of their time buried in the substrate and usually only emerge for food. Greens feed on standard roach fare of vegetables and fruits, showing a preference for apples in my colonies. A high protein gutload is made available every day, although P.nivea do not seem to have the high protein requirements that other species do. Daily removal of uneaten food and a light misting complete the care regime. Feeding P. nivea can be handled in several ways, in cages with tight fitting joints and small screen the roaches can be fed ad libitum, in cages that do not allow for free range feeding a feeding cup can be used. Feeding cups, if utilized, should be rimmed with a barrier of some kind to prevent escaping the cage, for feeding cups the Teflon based barriers are a better choice as there is less chance of consumption of the barrier by your chameleon. Camel Crickets - All chameleon keepers are familiar with the Brown House Cricket (Acheta domestica) that is commonly sold as a feeder species, these crickets are a part of everyday life for most of us. Camel Crickets (Ceutophilus spp.) 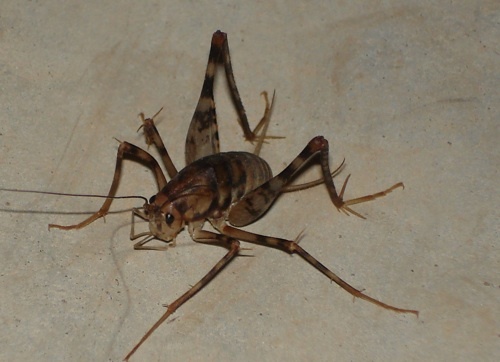 belong to the cave cricket group and are called camel crickets due to their arched back. Normally found in cool, humid and dark areas; these relatively large insects provide another excellent feeder addition. Wingless and up to one inch long camel crickets are similar in body design to their more common cousin with much longer hind legs and antennae. Female camel crickets posses large ovipositors and are quite easy to distinguish from males. Camel crickets are very easy to culture for feeding purposes. Our colony resides in a 10 gallon plastic storage container with no substrate. Stacked egg crates are provided for cover and climbing areas, a shallow container of moist vermiculite or coco fiber is provided for egg laying and food in the form of fresh vegetables and high protein gutload are provided daily. The container is kept in a cool area of the room and is lightly misted once a day to provide humidity and drinking water. The laying dishes are removed every two weeks and are placed in smaller containers setup exactly like the ones used for the adults. The total reproduction time is quite a bit longer than the standard cricket. Camel crickets can be fed in the same manner as a normal feeder cricket would be fed to your chameleon. Some keepers may want to remove the large hind legs before feeding. Moths - Wild moths can be easily added to your chameleon's diet in the warmer months of the year. The fluttering flight and soft body make them and excellent feeder addition. Moths are easily captured using your hands, a net or a bug catcher like the ZooMed Bug Napper (available at www.zoomed.com). Once captured simply release the moths into the cage and your chameleon will do the rest. Many keepers utilize wax moths for an alternative feeder as well. Wax worms have been a popular feeder for many years but many keepers simply don't think to use the adult moths as a feeder item. When feeding wax moths please use caution, these insects are considered a pest species by beekeepers and can quickly cause devastation in established hives. Grasshoppers & Katydids - Grasshoppers and katydids are readily accepted by most species of chameleons. These insects can be easily caught during the warmer months by hand or with a sweep net. Many a keeper can relate to the looks of passers by as they scour the fields looking for grasshoppers on summer days. Once caught, grasshoppers and katydids may be housed in tall screen cages with multiple sticks and grasses for climbing and hiding. They will readily feed on fresh grasses and grain mixes and should be kept warm and dry, near 90°. Grasshoppers can be cultured in captivity with enough patience and the proper setup. They should be provided a deep laying container with 2"-3" of moist sand, coco fiber or soil, as many species will deposit eggs several inches in to the ground. The entire cage including the laying tray should be lightly misted one to two times a day to provide drinking water and to keep the laying tray moist, the cage should dry relatively quickly after these mistings and should remain dry for most of the day. Assuming the colony was started with adult animals the trays can be removed every two weeks and covered to retain the moisture levels. Some individuals recommend that they eggs be kept cool for 2-3 months before being warmed to near 90°F for incubation, I have not found this cooling period to be necessary in most cases. There are many other insects that can be utilized for feeders in your chameleon's diet; lacewings, praying mantis, beetles, etc. can all be easily captured or purchased. As chameleon keepers we should constantly challenge ourselves to find new and interesting feeders for our animals. A note of caution must always be added to any captured feeder discussion. Many areas are sprayed with pesticides on a regular basis these pesticides can be stored in the gut of an insect and easily passed on to your chameleon. Be sure that any collection area you choose to use is 100% pesticide free. If you have any doubt about the status of an area, do not collect insects from this area and it is always better to be safe than sorry. Knowing which insects in your area are toxic should also be a priority.